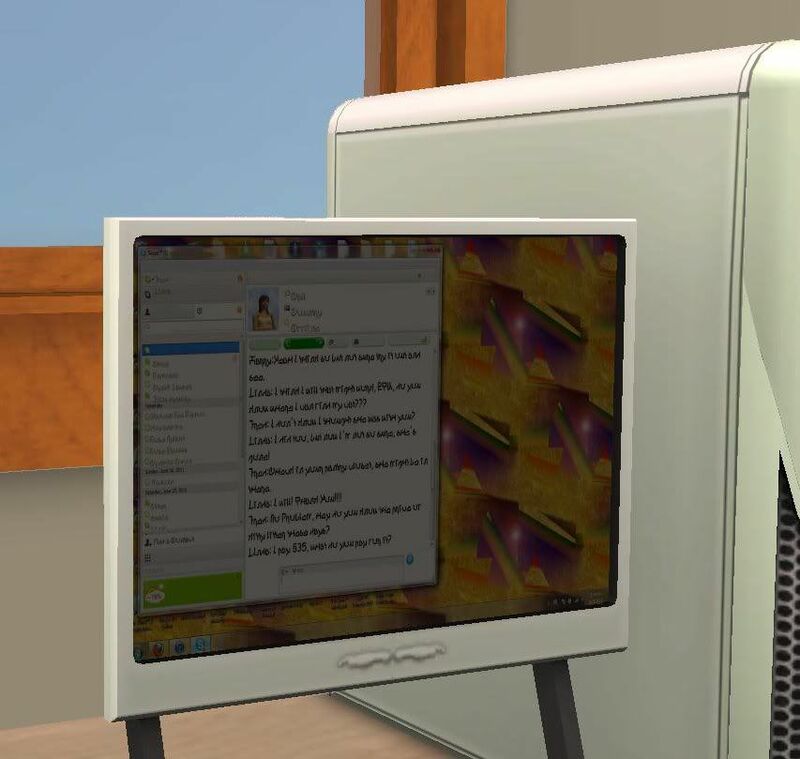 This is a default replacement chat screen for when sims use their computers to chat. All of the text is in Simlish. I got the idea from someone over at modthesims. No, I did not take their upload and put my own textures in, I made my own by extracting the chat screen textures from C:/Program Files/EA Games/The Sims 2 Double Deluxe/Base/Base/TSdata/Res/Sims 3D/Objects06 and making default replacements of them. I hope you enjoy! I'll be Mr. Anonymous for now but it's been bugging me all day and I literally don't know where to look. Where do you find the computer screen files in the first place? I'd like to make my own and I have no idea where to look. Good thing I saw this comment. You go to the directory in the post of this upload, then find the TXTR (it helps if you click on name at the top to sort them in alphabetical order) and right click on it and do extract, save it somewhere. Then do file close, then file new in simPe at the top in the resource (list?) don't have simPe open. The big white empty space to the right, right click and do add. 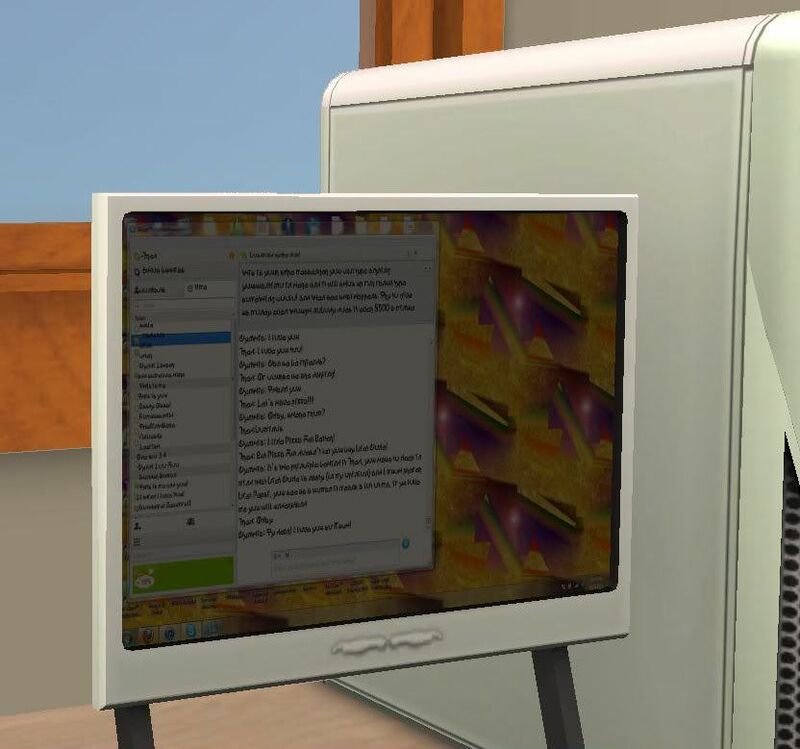 Then take a screenshot of your computer screen (it's what I do) and resize it to a valid Sims texture size in width and height, (1024,512,256) and save to your downloads folder. Yup I have the DXT thing and I already knew that part you are right about that. Question what if I wanted to replace all the computer screens, where would I look to find those in SimPE? Try looking in that directory under Objects 06 or Textures it's in one of those. Yup you were right again I should have read your description in the first place lol. Quick question, do I have to make it all three image sizes (1024,512,256)like you said or just the biggest one? Your texture should be either 1024x1024 or 1024x512 or 512x512 or 256x356 or 512x256 in size any of those combinations is fine. Keep in mind, the larger the texture the higher quality the image is in The Sims. I like to use 1024 sized textures as much as I can and have gotten some criticism because of that because it slows things down, but I think it's a small price to pay for quality images. Ok it mostly works, but is there anyway to brighten the texture so it doesn't appear so dim in the game? Nix over at MTS and another site I'm apart of discovered how to get the base game screens to be the same brightness as the FT screens. I thought you would like to know seeing how I pestered you enough lol. I'm a little late (almost a year haha) but thanks for putting in a link to that.